In a much anticipated return, Shaun Ryder is back... and he is bringing Black Grape with him. The band, who achieved a number one album in the 1990's with It's Great When You're Straight...Yeah will be performing their first gig in over twelve years at this year's 'Get Loaded in the Dark' festival in London. 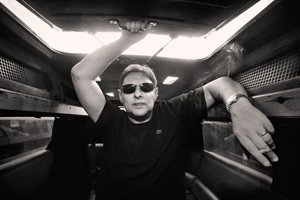 Shaun Ryder, the man, the myth, the legend. Since his wild rollercoaster of a career kicked off in the 1980's with The Happy Mondays, Shaun's life has hardly seen a dull moment. Following a number of different musical ventures, including several reincarnations of the Monday's, second band Black Grape and collaborations throughout the years with successful artists like Gorillaz, on top of a 24 hour party lifestyle and a drug addiction, Ryder is still standing and is about to return once again with the second coming of band Black Grape, showcasing on the big stage of 'Get Loaded in the Dark' at the Coronet, London on April 1, the same event which once reincarnated Happy Mondays'. Ryder discussed his influences and his relationship with the event. "The organiser, Danny Newman is a sound guy. The event in itself, it's dead exciting! I prefer performing in London to a London crowd much better than Manchester you get too many people coming out of the wood work back there and it gets too mad!." Ryder, who had always been keen to revive Black Grape, told us of the long term plans for this to come into fruition. "It's something we always said we'd do we never ended it, which was the same situation with the Happy Mondays. It's something we have there to go back too and look forward to doing. I'm lucky in that sense". With the return of Black Grape' coinciding alongside the release of a greatest hits album, some have questioned whether these are purely promotional tactics to make the album shift more units, Ryder denies these claims. "It's not for promotional reasons so we can all make a bit of money as people might think. Even though we have got the Greatest Hits or whatever you want to call it being released, we are doing it because we always have a good laugh and it's something we wanted to do". To reinforce this statement, when questioned about the future, Ryder even promises that the band is due to release new material in the future. "We have a new album lined up that is ready to be worked on, we just need to get in the studio to do it". The formation of Black Grape still includes two of the original members of the Happy Mondays. Ryder himself, and Bez, who lived through and experienced the Factory Records days the Manchester based independent label which championed acts of the late seventies early eighties. Ryder, ever the joker, recollects that time with a costly incident. "I remember a time where I was sat on this dead expensive table hanging from the ceiling think it was worth about £30,000-£40,000 back then and it came crashing down with the roof. I found it absolutely hilarious! Don't think anyone else did though." It is credit to Ryder's talent as a songwriter and an artist, that he has achieved a body of work throughout the years to be compiled into an album of greatest hits calibre, with him achieving great success in all of his endeavours throughout the years through each of the pieces of work that he has put his hand to. It is through these successful times however that he has also been dogged by personal demons in his addiction to drugs. This, it's fair to assume - is a key contributor in some of the craziest moments in his life, which he reflects upon. "There have been too many moments but the most notable incident that always comes in to my head is having 15 car crashes in one trip to Barbados. Absolute madness." In 2004, this lifestyle was documented by the BBC in a one off documentary titled 'Shaun Ryder: The Ecstasy and the Agony' where Shaun was followed around for ten months in a fly in the wall style glimpse at his life. "That was life changing. Shaun told us in reflection. "I've tried to sort myself out since then, clean up, stay out of court". Despite calming down somewhat, Shaun still promises the big return gig in April will as highly charged as ever, and in the same fashion as fans have become accustomed to witnessing from Black Grape in the past. "This will be chaos! I guarantee a really good party - A typical Black Grape performance which means good music and good times."